With the development of space technology, more and more spacecrafts have been launched to carry out specific space missions. Once damaged or failed, these spacecrafts will become uncontrolled orbital trash. This phenomenon poses a threat to the normal operation of other spacecraft and the personal safety of astronauts, which seriously affects human space activities. This type of spacecraft does not have a cooperative marker, and there is no device for docking specifically. Their pose orbits are uncontrolled and they belong to non-cooperative targets. In order to ensure the space activities smoothly, the on-orbit service technology toward non-cooperative targets will become a serious problem that the space powers must face. However, the premise of the on-orbit service technology is the relative position and pose measurement of non-cooperative target. The method of pose measurement based on geometric features is a trend, because the data process is little, the algorithm is simple, and the dependence on the target is small. Common geometric features include solar windsurfing brackets and docking rings. 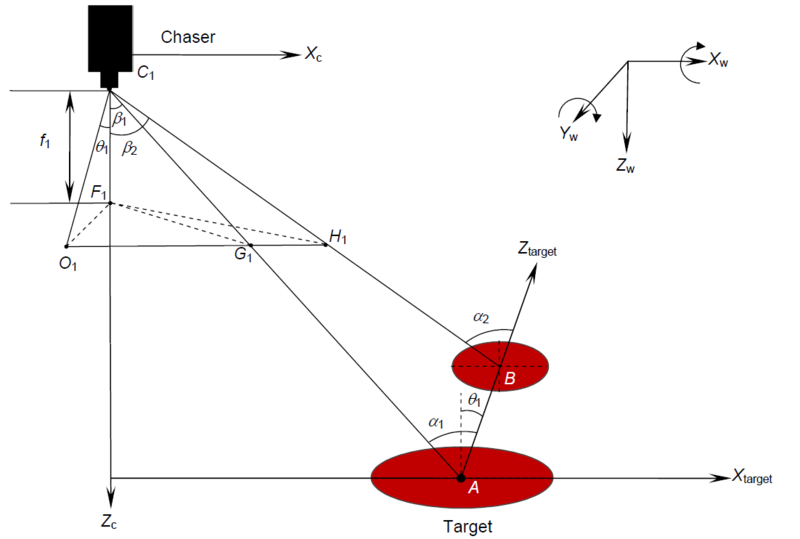 At the time of super close-range rendezvous and docking, the target is not completely within the camera field, so the overall contour of the target cannot be imaged. While the docking ring and engine nozzle size are suitable and structural features are outstanding, which can meet the requirements of super close-range imaging. In this paper, based on the concentric circle positional relationship with spatial parallelism but not coplanar between the docking ring and the engine nozzle of the space non-cooperative spacecraft, the research on the non-cooperative target super close-range pose measurement model is carried out. A research team of Chen Xiaomei, an assistant Professor at the School of Optics and Photonics, Beijing Institute of Technology, is dedicated to the study of non-cooperative target pose measurement algorithms. 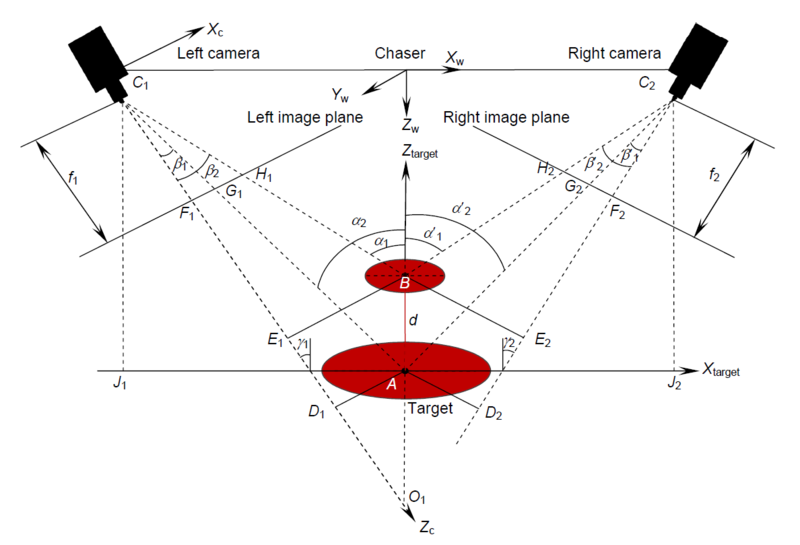 Based on the monocular vision measurement algorithm and the classical circular pose measurement geometry method, a binocular vision measurement algorithm based on concentric circle features is proposed. The algorithm does not need to manually mark the target center and the target radius, and the geometrical relationship and the least squares method can be used to determine the size of the docking ring and the engine nozzle, the center projection position and the distance between the docking ring and the engine nozzle. The algorithm improves the angular adaptability of the model by discussing the solution of the pose angles under three different positional relationships. Finally, the algorithm is verified by simulation. The simulation results show that the pose measurement error of the algorithm is less than 0.5°. Even if there is a certain installation error, the pose measurement error can reach within 1°. Since the circular surface feature is a ubiquitous geometric feature, the pose measurement based on the circular feature plays an important role in the field of machine vision, and its application field will be further expanded in the future. The algorithm of this paper can be applied to the recognition and positioning of circular signs in automatic driving and navigation of industrial robots. The research team of assistant professor Chen Xiaomei, School of Optics and Photonics, Beijing Institute of Technology is affiliated to the Key Laboratory of Photoelectronic Imaging Technology and System, Beijing Institute of Technology, Ministry of Education of China. The laboratory has a long history of research and development in the field of image processing, which has established close cooperative relations with many research institutes and user units such as the General Aviation Investigation Bureau, the National Satellite Resource Center, the State Bureau of Surveying and Mapping, and the China Academy of Space Technology. The main research direction of the team is photoelectric imaging modeling and evaluation, image processing and analysis. Now mainly engaged in satellite full-link imaging simulation and satellite docking technology. The current research team has a postdoctoral, two doctors, and five masters, which has undertaken and participated in many scientific research projects such as the national 863, 973, natural fund, basic research on weapons and equipment pre-research, major national science and technology projects, and national major science and technology infrastructure construction projects. The team has published more than 50 academic papers in international/domestic and has won the second prize of National Defense Science and Technology Progress Award. Wang K, Chen X M, Han X. Research on pose measurement between two non-cooperative spacecrafts in close range based on concentric circles[J]. Opto-Electronic Engineering, 2018, 45(8): 180126.